A native of India based in Rome, Pr Kuruvachira is a Roman Catholic priest who also teaches at the Salesian Pontifical University. He is a recognized specialist in interfaith dialogue. Pr Kuruvachira was first a EUCLID student (at the Master’s level, even though he already held a PhD in Philosophy, Pontifical Gregorian University) and subsequently joined the EUCLID faculty corps. 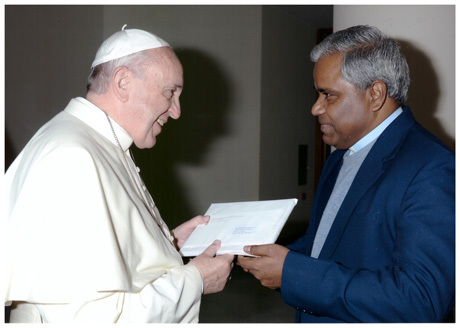 Photo: Pr Kuruvachira photographed with Pope Francis in 2015.